FM for Fire schedules, tracks and documents inspection and maintenance activities on all types of fire & life safety equipment. The system ensures data integrity by eliminating paper forms or logsheets, while providing proof of compliance with NFPA, OSHA, JCAHO and other internal or external regulatory agencies. FM for Fire is available in three different packages to fit the needs and size of your facility. Each package contains the same features and functionality – the only different is the number of checkpoints that can be tracked for inspection. PROTRAC Security is a guard tour management system that uses hand-held devices or touch tag readers to document that security officers have visited their required check points. With each scan of a bar code, the time, date and location of each security inspection is recorded, offering management accountability for their security staff's activities and safeguards against insurance liability. The hand-held device directs the Officer to checkpoints on the route and can prompt the Officer through a series of tasks if an inspection is required. Once the routes are completed, the device is placed into a cradle that transfers the inspection data to a central database. The system then allows management to generate reports and charts detailing all inspection activities. 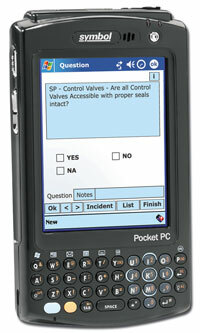 This Pocket PC offers the functionality of Windows in a small, lightweight computer. The CN2B is designed to survive heat, humidity, and multiple drops to concrete or steel. It features an integrated linear imager and 802.11b wireless capabilities. Size: 5.8" x 3.4" x 1.4"
The PulseStar is a rugged touch tag reader designed for the harshest environments. It has 48K of memory and stores up to 5400 touch reads. It is powered by a 3-volt lithium battery that requires no charging. The LaserLite Pro is a durable device that combines bar code reading with touch tag reading. It is lightweight and ergonomically designed and is housed in a durable metal case. The LaserLite Pro has 128K ROM and 256K RAM and is powered by four standard AA alkaline batteries that provide 2400 mAh of power capacity. It reads up to 100,000 bar codes or 300,000 touch tags. The LaserLite features the same rugged construction as the LaserLite Pro, but reads only bar codes. The CS1504 is a pocket sized bar code scanner. It is easy to use and captures up to 300 scans. Each scan is time and date stamped to provide proof of activity. This small device is perfect for scan and go guard tour routes.